Ewan McGregor seems like a great guy to hang out with. The sort that has a ton of great stories to share over a beer. And that thick English accent of his will only make his stories even more captivating. But more than all that, he seems like a genuinely nice guy from what I've seen of him in Star Wars. And niceness is a quality that is getting harder to find these days. Thankfully, not with these two motorcycles. They are the nicest motorcycles that I have come across this year. Don't get me wrong now. 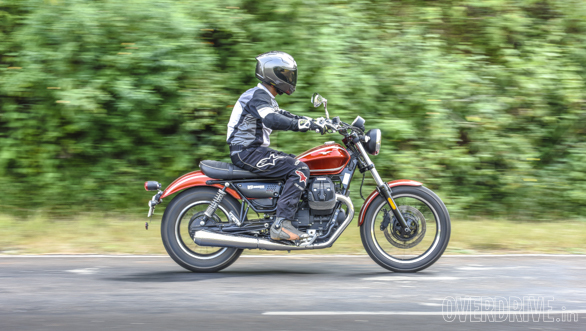 There have been motorcycles that have made me cry and others that wanted to pull my hair out. There have even been some that almost made me walk into a bank, begging for money. But these are unlike any of those motorcycles. These give you that warm fuzzy feeling - hot cocoa on a cold, rainy day. Now, what you see here are two motorcycles that are the same motorcycle. Then again, they are also the same motorcycle that are two very different motorcycles. Confused? Don't worry, you'll understand soon enough. 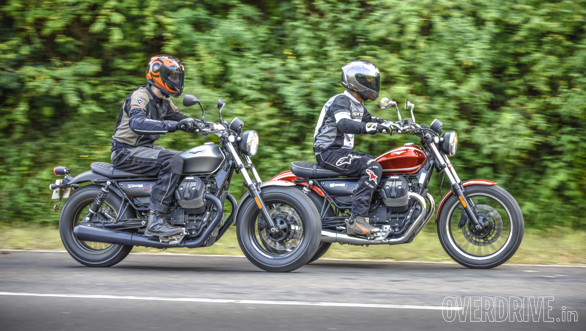 The Moto Guzzi V9 Roamer and Bobber are the newest of the Guzzis and are part of the new V9 family of motorcycles. 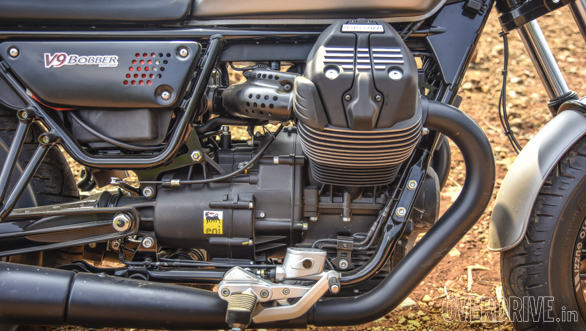 The V9s use a new 853cc transverse V-twin motor that is both oil and air cooled. The motor makes 55PS at 6,250rpm and 62Nm at 3,000rpm. You may scoff at the measly 55PS, but the V9's trump card is torque. From just above idle right up to redline, the engine is always putting out more than 50Nm of torque. This means that the moment you let the clutch out, the V9s start surging forward. 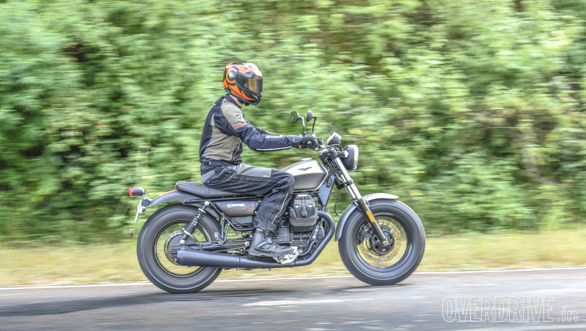 With the two level traction control turned off, both the motorcycles are more than happy to light up the rear tyres and lay darkies everywhere. In fact, if you're an experienced motorcyclist, you might enjoy having the MGTC turned off at all times. Either way, 60kmph comes up in no time and a 100kmph-plus cruise speed is no stress at all. And with all that torque on tap you don't have to fiddle around with the clunky six speed gearbox too much either. 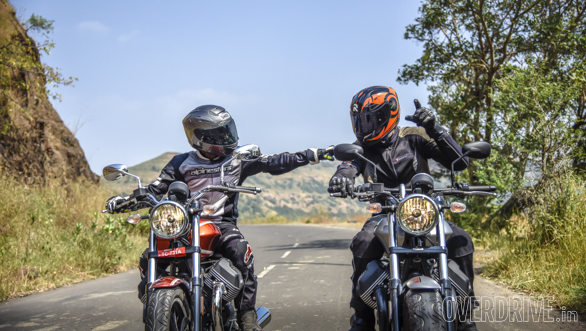 You can just sit in your gear of choosing and with some crafty steering work and some far sightedness, get away with not having to touch the gear lever or clutch at all. And all that while, you will appreciate the smoothness of the big twin that is sticking out right before your knees. As far as V-twins go, the V9s' 853cc unit is one of the most refined motors out there. Of course, being a V-twin, it does vibrate like a loose blender at idle. 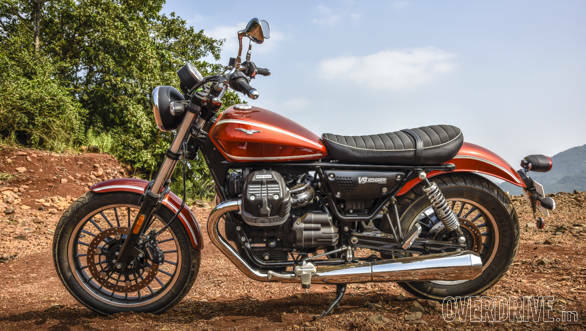 But the moment you gas it to anywhere above idle, it goes into an eerie calm that is disturbed only by the sideways lurch of the transverse engine and that subdued engine note that is typically V-twin. The engine sits in a steel, twin cradle frame that is attached to the cast wheels via a traditional fork up front and dual hydraulic shocks attached to a steel swingarm and driveshaft at the rear. 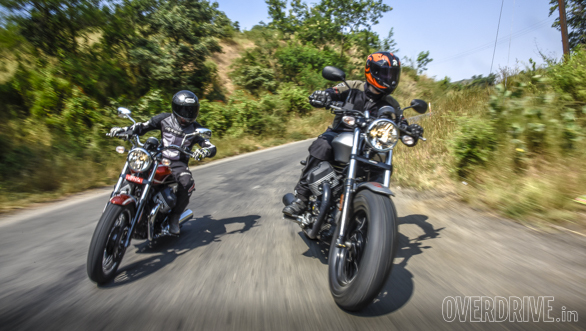 Both the motorcycles handle well, but when you start dissecting their dynamic behaviour, differences stand out. The differences are mainly due to the change in geometry between the Roamer and Bobber. 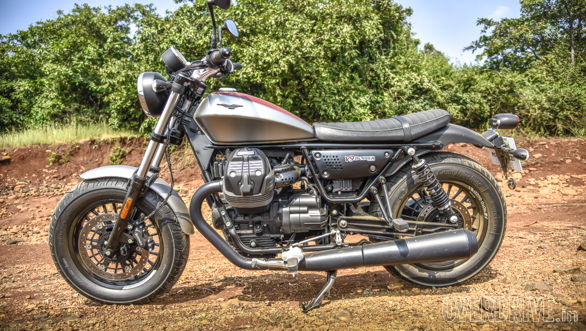 Even though the chassis itself is the same with regards to headstock angle and offset, there is a lot of difference in the trail and wheelbase of each motorcycle. 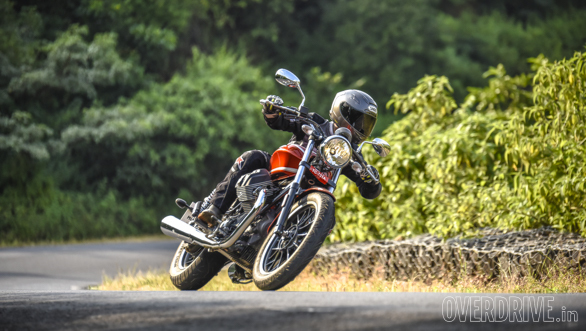 Where the Roamer uses a 100 section tyre in on a 19-inch wheel up front, the Bobber uses a 130 section tyre on a 16-inch wheel. This alters the steering geometry a fair bit and gives the Bobber a trail of 116.1mm while the Roamer gets an extra 9mm. You can feel the difference while riding. 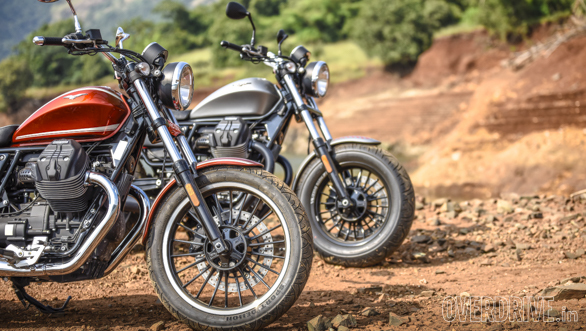 The Bobber feels more eager to turn into corners while the additional wheelbase and trail of the Roamer takes a bit more effort to change direction. The Roamer's front end also feels a bit disconnected when compared to the Bobber. But despite the differences, both the motorcycles excel at going around corners. So much that before you know it, you'll be scraping your footpegs. All this, while having a firm yet absorptive ride quality that won't break your back. But what this motorcycle really likes to do is run around through city streets, stopping every now and then to let people admire what are two good looking motorcycles. The V9s are incredibly good looking motorcycles along the same lines of the new smaller Triumph twins. 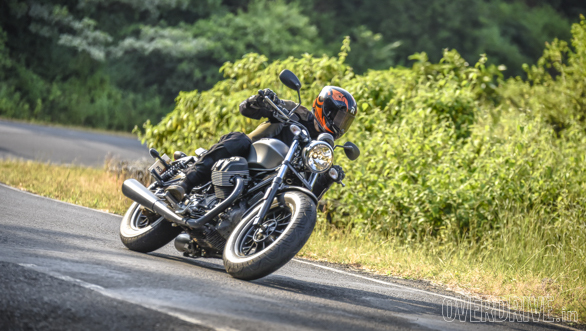 Think of the Bobber as a worthy adversary to the Street Twin with its matte black paint and factory custom looks and the Roamer as an opponent to the new T100 with its shiny chrome and retro good looks (both in terms of product positioning, of course). 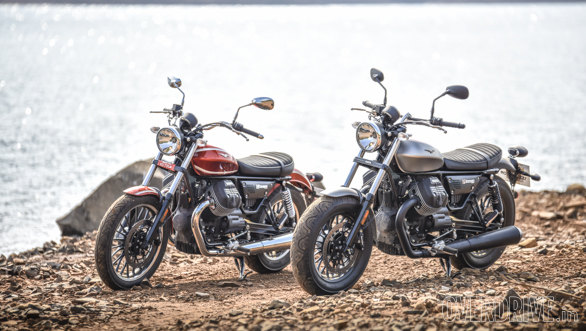 And in the same way as the two Triumphs, both the V9s are excellent style statements if you're the sort that goes around town in a brown leather jacket and blue jeans wearing a Bell Custom 500 and Ray-Ban Wayfarers. You know the type. The same person who wouldn't mind spending the Rs 16.83 lakh (on road Pune) that each of them cost. But no matter who you are - leather jacket wearing celebrity or tshirt and shabby jeans wearing moto-hack - you just can't deny how nice these bikes are. They might not be scorching performers, but they make you smile. I'm telling you, from the time Rishaad and I picked up our test bikes from Moto Guzzi, we had these massive smiles plastered on our faces. There are motorcycles that make you laugh and there are ones that make you cry. But most often than not, it's the ones that make you smile that you will keep going back to. 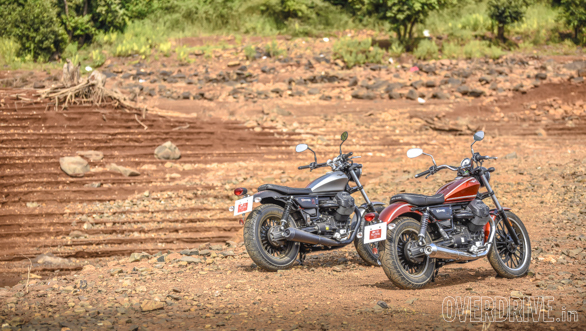 The Roamer and the Bobber belong to that category of motorcycle. They are the really nice bikes that make you happy. No wonder then that Moto Guzzi got Ewan McGregor to endorse them. He seems like a really nice guy!